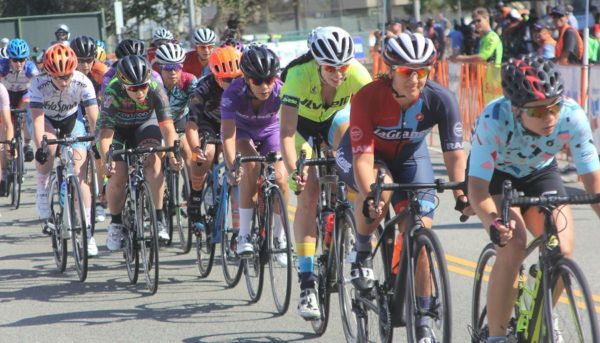 More than 300 cyclists and runners from across the country and the globe gathered for the 57th annual Chevron Manhattan Beach Grand Prix held Sunday. Cyclists zipped through the Manhattan Beach streets of Valley and Ardmore Drive, past residents who set up barbeques and lemonade stands for makeshift viewing parties. New this year to the race was the Manhattan Mile. Young adults, parents and their children along with elderly people were among the runners. The Grand Prix hosted an unprecedented number of state championships in this year’s competition with six, including the men’s and women’s category 1-3 races, the fastest events of the competition. Winners of the top races, the Men’s Pro 1-2 and the Women’s Pro 1-3 were Justin Williams of Los Angeles, and Coryn Rivera of Tustin, respectively. Winners In the men’s competition also included Christian Molina (Cat 2), Chris Hildreth (Cat 3), Moses Pajarillaga (Cat 5), Martin Sanders (Cat 4), Craig Miller (Master 50+), Cyril Hunte (Master 60+), Kyle Hanson (Master 35+) and Charon Smith (Master 40+). Women victorious in their division were Kate Mardayat (Cat 2), Randi Gino (Cat 3), Chloe Patrick (Cat 4) and Ana Odette Castaneda (Cat 5). Of the 300-plus people who competed, the youngest was Chloe Patrick, a 14-year-old from Carson. Not only was she the youngest, but she also won her category, the women’s level four. To win she beat out Georgeta Ungureanu, 27, a cyclist who the announcers nicknamed the “Romanian rocket”. This was Patrick’s first win on the road. She began biking when she was two years old and took her training wheels off at the age of three when her older sister took hers off. Patrick wasn’t the youngest person on the track, however. The Grand Prix hosted a kid’s race where children as young as two could compete in shortened versions of the track. Every child completing the race received a medal. The Grand Prix also featured a men’s 60+, 50+, 40+ and 35+ year old category. The oldest person to compete in the race was 71 years old. This was the second consecutive year the MB Grand Prix decided to have racers cycle counter-clockwise around Valley Drive. Despite the race’s new safety precautions, there were at least four crashes on the course. Manhattan Beach Police Community Responders were quick to respond to the accidents and those in need of medical attention were taken to the medical tent. Some riders however, despite suffering bleeding wounds, got back on their bikes and continued their races.